Much of the attention of the first National Agriculture Day #AgDay is focused on primary producers and rightly so. There are more than 85 500 farm businesses in Australia and the gross value of Australia's agricultural production in 2015/2016 was $56 billion, according to the Australian Bureau of Statistics (ABS). For those of us who work in the farm sector and live in regional Australia, the value of agriculture and its related industries is close to home and easy to see. It's there when we look in the paddocks, visit the saleyards, drive past the machinery dealerships, or walk down the main street of our regional communities. The challenge is raising awareness outside the regional footprint, in cities and, dare I say it, among policy makers and politicians. This is where #AgDay has an opportunity to make a real difference because agriculture does not stop at the farm gate. In 2017, more than 323 000 people were employed in agriculture, forestry and fishing but if you consider those employed in the farm input and output sectors, the National Farmers Federation (NFF) says agriculture supports more than 1.6 million jobs in areas like transport and logistics, retail and processing. That means roughly 80 per cent of agricultural jobs are beyond the farm gate and the opportunities are wide and varied. Research by Charles Sturt University (CSU) Emeritus Professor Jim Pratley in 2016 showed that for those studying agriculture at university there's more than five jobs per graduate, with a wide choice in career paths from finance and government through to processing, manufacturing, and directly on farm. That's worth noting when we're talking to our children about potential career opportunities in this dynamic sector. In the same way that agriculture stretches beyond the farm gate so too does the challenge for innovation. The Graham Centre for Agricultural Innovation, a research alliance between CSU and the NSW Department of Primary Industries (DPI), recognises this challenge and we're working with industry to identify and realise opportunities to ensure the whole value chain is profitable and sustainable. For example, we're undertaking research in the paddock to develop integrated weed management systems, to understand soil acidity and to improve the nutrition and health of livestock. Further up the value chain our researchers are examining how to improve processing for canola oil and to develop new grain-based products. Our scientists are also working to unlock health benefits from functional foods, and conducting consumer research to better understand markets to improve returns throughout the value chain. We also believe that it's important for our research students to gain experience across the whole value chain so they have a better appreciation of how their contribution can benefit the entire industry and contribute to thriving rural communities. More than stretching beyond the farm gate, the Graham Centre's research impact stretches internationally. The Centre is proud to be involved in projects working directly with farmers in Pakistan, Lao PDR and India, to name but a few countries, to develop new production techniques, empower farmers and improve the lives of people in rural communities. There's no doubt Australia's agricultural sector is productive, adaptive, and over the years has developed new technology and management practices. While National Agriculture Day #AgDay is an opportunity to reflect on these achievements, it's also an opportunity to consider how we can put our knowledge and expertise to work in developing countries to improve livelihoods and tackle the global food security challenge. 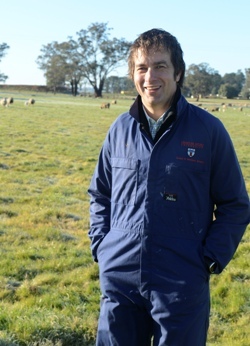 Professor Michael Friend (pictured) who wrote this op-ed is the Director of the Charles Sturt University (CSU) Graham Centre for Agricultural Innovation. Contact CSU Media to arrange interviews with Professor Michael Friend.